[AUTO]:When another «Royal Paladin» rides this unit, you may call this card to (RC). 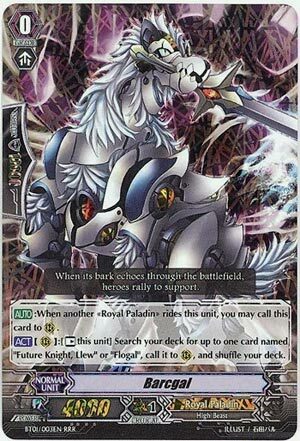 [ACT](RC):[[Rest] this unit] Search your deck for up to one card named “Future Knight, Llew” or “Flogal”, call it to (RC), and shuffle your deck. The ultimate starter for Premium Royal Paladin. You only need to open with a Grade 1 and then you don’t even need to have a G2 in hand unless you’re playing a habitual sniper.